This post originally appeared 9/30/16. The magazine’s hand-drawn art on every other page had a loose, fun style, and it broke up the monotony of screenshots. There was art that decorated the margins. And then there was the fan art. 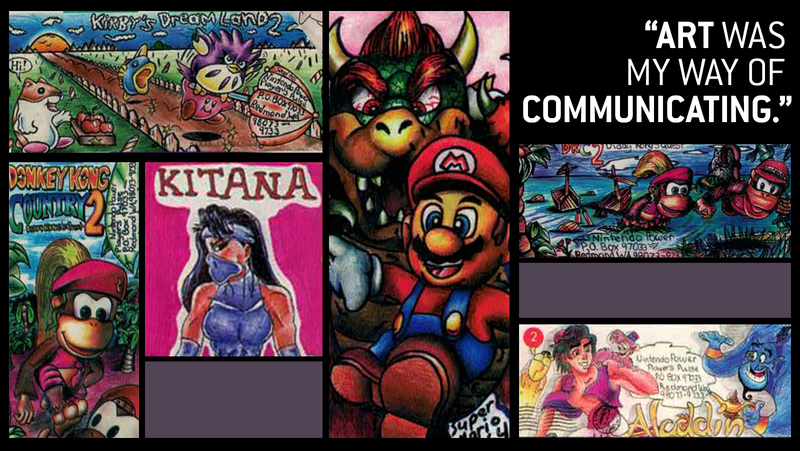 Every month, in its “Player’s Pulse” section, Nintendo Power invited its readers to submit “envelope art.” They would then print the best submissions, usually every other month, but sometimes every month, probably if the haul was decent. Naomi Chiba had been a diehard Nintendo fan since she was seven. She grew up in Cincinnati, Ohio and loved playing Nintendo games. A few years after she started playing, a family friend got her a subscription to Nintendo Power. Chiba enjoyed looking at other people’s art, and she soon began submitting her own. In the summer of 1994, Nintendo Power published the first of many Chiba pieces: a drawing of the SNES cover for Aladdin. It’s the second one down on the left. “I had been into art, somewhat, but Nintendo helped me get a start,” Chiba told Kotaku in a phone interview. She said Nintendo Power was her primary creative outlet as a young girl. Chiba was a quiet kid. She had a small group friends, but mostly kept to herself. Games were a place of fantasy for her. She loved the swashbuckling sense of adventure in Nintendo’s most popular games, and she identified with the characters, particularly those from the early Final Fantasy games. And here’s another envelope based on Final Fantasy III. Chiba was published so frequently that the readers began taking notice. One reader raised a fuss with a weird, accusatory letter, which compared Chiba’s omnipresence to the bubonic plague. “Does Naomi pay you to put her art in Player’s Pulse?” the reader asked. “It was interesting,” Chiba said. It was also the closest thing to a personal response that Chiba received from the editorial staff, although she never expected to hear from them at all. Chiba continued drawing and submitting art to Nintendo Power up until 2000. She was in college by that point. She lost interest in video games but continued to express herself through drawing, studio art, and ceramics. She graduated from UCLA with a Bachelor’s degree in Art History, and she credits Nintendo with igniting that personal passion. Today, Chiba doesn’t work in an art- related field, but she still sometimes pursues her artistic interests. Chiba mostly expresses herself through cosplay, most recently at the Anime Expo in California this past July. Among her self-made costumes are Jade Curtiss from Tales of the Abyss and Hikaru Shidou from Magic Knight Rayearth. “It’s easier [now] to connect,” Chiba says. When I really think back to my small town childhood, I agree with her. It was never easy to find other kids with my idiosyncratic interests. But there was Nintendo Power. And fan art like Chiba’s meant that out there, somewhere, there were other kids like me, who loved the nerdy things that I loved, too.